Digital Light Processing (DLP) is a trademark owned by Texas Instruments, representing a technology used in some TVs and video projectors. It was originally developed in 1987 by Dr. Larry Hornbeck of Texas Instruments. DLP is used in DLP front projectors (small standalone projection units) and DLP rear projection television sets. It is also one of the leading technologies used in digital cinema projection. DLP, along with LCD and LCoS, are the current display technologies behind rear-projection television, having supplanted CRT rear projectors. These rear-projection technologies compete against LCD and plasma flat panel displays in the HDTV market. The single-chip version of DLP and 3LCD are the two main technologies used in modern colour digital projectors, with the two technologies being used in over 95% of the projectors sold in 2008. In March 2008, TI announced the initial production of the DPP1500 chipset, which are micro projectors to be used in mobile devices. Availability for final products would show up in the market early 2009. In DLP projectors, the image is created by microscopically small mirrors laid out in a matrix on a semiconductor chip, known as a Digital Micromirror Device (DMD). Each mirror represents one or more pixels in the projected image. The number of mirrors corresponds to the resolution of the projected image (often half as many mirrors as the advertised resolution due to wobulation). 800x600, 1024x768, 1280x720, and 1920x1080 (HDTV) matrices are some common DMD sizes. These mirrors can be repositioned rapidly to reflect light either through the lens or on to a heat sink (called a light dump in Barco terminology). 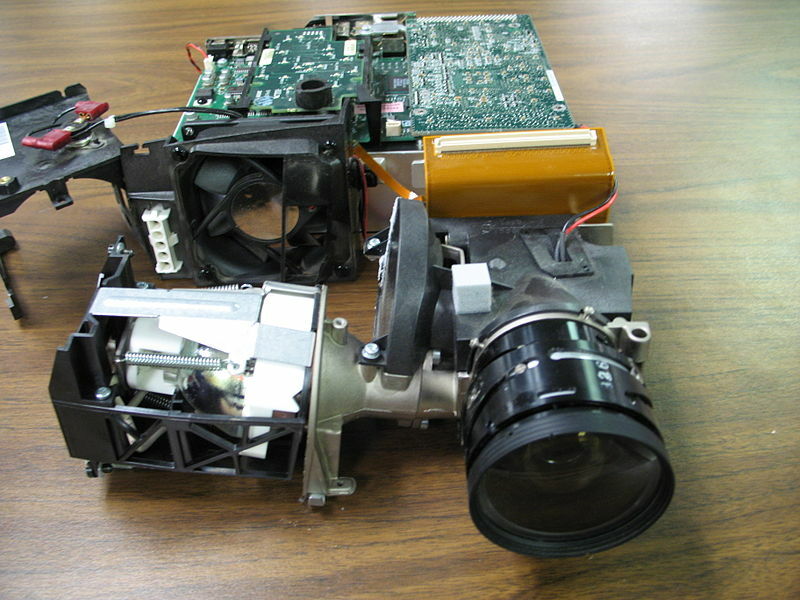 There are two primary methods by which DLP projection systems create a color image: those utilized by single-chip DLP projectors, and those used by three-chip projectors. A third method, sequential illumination by three colored light emitting diodes, is being developed, and is currently used in televisions manufactured by Samsung. Yet another method, color lasers, is currently in use by Mitsubishi in their LaserVue products. 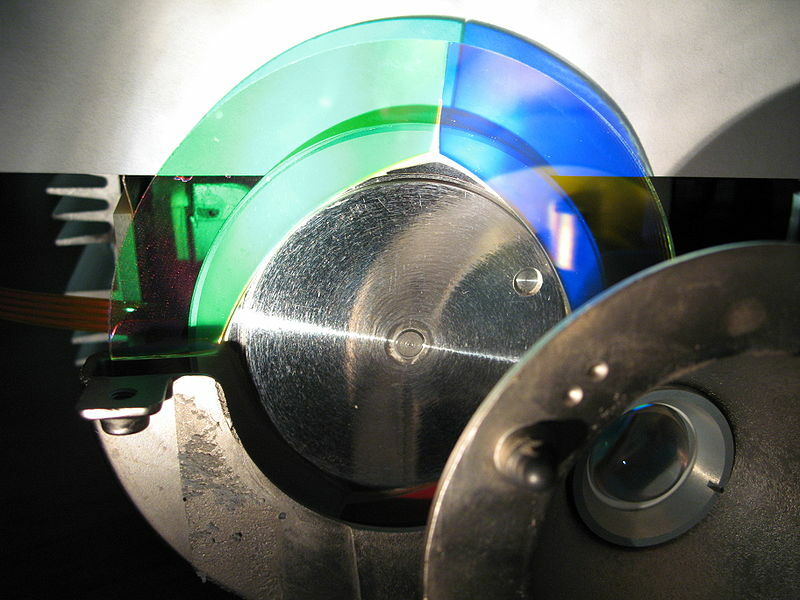 In a projector with a single DLP chip, colors are produced either by placing a color wheel between a white lamp and the DLP chip or by using individual light sources to produce the primary colors, LEDs or lasers for example. The color wheel is divided into multiple sectors: the primary colors: red, green, and blue, and in many cases secondary colors including cyan, magenta, yellow and white. The use of the secondary colors is part of the new color performance system called BrilliantColor which processes the primary colors along with the secondary colors to create a broader spectrum of possible color combinations on the screen. 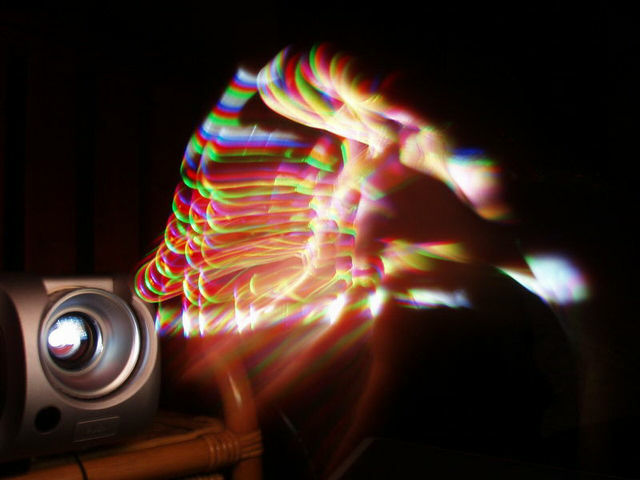 A single-chip projector alternates among colors and produces separate red, green, and blue images when displaying a moving image, or in this case, illuminating a moving hand. DLP projectors utilizing a mechanical spinning color wheel may exhibit an anomaly known as the "rainbow effect." This is best described as brief flashes of perceived red, blue, and green "shadows" observed most often when the projected content features high contrast areas of moving bright or white objects on a mostly dark or black background. The scrolling end credits of many movies are a common example, and also in animations where moving objects are surrounded by a thick black outline. Brief visible separation of the colours can also be apparent when the viewer moves their eyes quickly across the projected image. Some people perceive these rainbow artifacts frequently, while others may never see them at all. This effect is caused by the way the eye follows a moving object on the projection. When an object on the screen moves, the eye will follow the object with a constant motion, but the projector will display each alternating color of the frame at the same location, for the duration of the whole frame. So, while the eye is moving, it will see a frame of a specific color (red for example). Then, when the next color is displayed (green for example), although it gets displayed at the same location overlapping the previous color, the eye will have moved toward the object's next frame target. Thus, the eye will see that specific frame color slightly shifted. Then, the third color gets displayed (blue for example), and the eye will see that frame's color slightly shifted again. This effect is not perceived only for the moving object, but the whole picture. The effect varies with the rotational speed of the color wheel and the frame refresh rate of the video signal. There is a maximum rotational speed limit for the wheel, typically 10,000 to 15,000 RPM. Video framerate is usually measured in frames per second and must be multiplied by 60 to find the wheel speed, whereas 60 frames/sec equals 3,600 frames/minute. If the color wheel spins 4 times per frame, it is rotating at a speed of 14,400 RPM. (Projector specifications often list the wheel speed at specific framerates as 2x, 3x, 4x, etc.) Increasing the video refresh rate to 85 frames per second does not necessarily further reduce the rainbow effect since this rate would increase the wheel speed to 20,400 RPM, potentially exceeding the safe limits of wheel rotation and requiring the projector to drop back to 3x speed, at 15,300 RPM. Multi-color LED-based and laser-based single-chip projectors are able to eliminate the spinning wheel and minimize the rainbow effect since the pulse rate of LEDs and laser are not limited by physical motion. "Three-chip DLP projectors have no color wheels, and thus do not manifest this artifact." 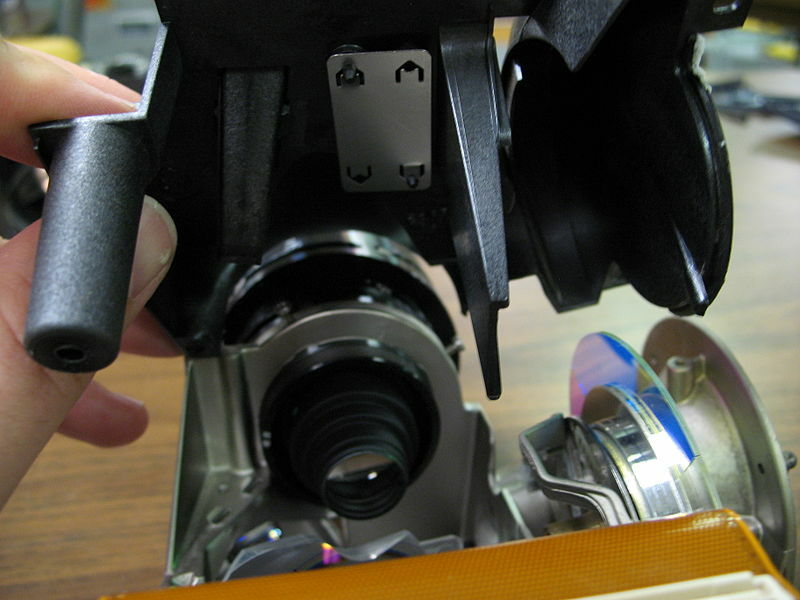 The main light source used on DLP-based rear screen projection TVs is based on a replaceable high-pressure mercury-vapor metal halide arc lamp unit (containing a quartz arc tube, reflector, electrical connections, and sometimes a quartz/glass shield), while in some newer DLP projectors high-power LEDs or lasers are used as a source of illumination. For metal-halide lamps, during start-up, the lamp is ignited by a 5000 volt pulse from a current-regulating ballast to initiate an arc between two electrodes in the quartz tube. After warmup, the ballast's output voltage drops to approximately 60 volts while keeping the relative current high. As the lamp ages, the arc tube's electrodes wear out and light output declines somewhat while waste heating of the lamp increases. The mercury lamp's end of life is typically indicated via an LED on the unit or an onscreen text warning, necessitating replacement of the lamp unit. Older projectors would simply give a warning that the lamp life had expired but would continue to operate. Newer projectors will not power up until the lamp is replaced and the lamp hours are reset. Most devices include a lamp hours reset function for when a new lamp is installed, but it is possible to reset a projector to continue to use an old lamp past its rated lifespan. When a metal-halide lamp is operated past its rated lifespan, the efficiency declines significantly, the lightcast may become uneven, and the lamp starts to operate extremely hot, to the point that the power wires can melt off the lamp terminals. Eventually, the required startup voltage will also rise to the point where ignition can no longer occur. Secondary protections such as a temperature monitor may shut down the projector, but a thermally overstressed quartz arc tube can also crack and/or explode, releasing a cloud of hot mercury vapor inside and around the projector. However, practically all lamp housings contain heat-resistant barriers (in addition to those on the lamp unit itself) to prevent the red-hot quartz fragments from leaving the area. The first commercially-available LED-based DLP HDTV was the Samsung HL-S5679W in 2006, which also eliminated the use of a color wheel. Besides long lifetime eliminating the need for lamp replacement and elimination of the color wheel, other advantages of LED illumination include instant-on operation and improved color, with increased color saturation and improved color gamut to over 140% of the NTSC color gamut. Samsung expanded the LED model line-up in 2007 with products available in 50", 56" and 61" screen sizes. For spring 2008, the third generation of Samsung LED DLP products are available in 61" (HL61A750) and 67" (HL67A750) screen sizes. Ordinary LED technology does not produce the intensity and high lumen output characteristics required to replace arc lamps. The special patented LEDs used in all of the Samsung DLP TVs are PhlatLight LEDs, designed and manufactured by US based Luminus Devices. A single RGB PhlatLight LED chipset illuminates these projection TVs. The PhlatLight LEDs are also used in a new class of ultra-compact DLP front projector commonly referred to as a "pocket projector" and have been introduced in new models from LG Electronics (HS101), Samsung electronics (SP-P400) and Casio (XJ-A series). Home Theater projectors will be the next category of DLP projectors that will use PhlatLight LED technology. At InfoComm, June 2008 Luminus and TI announced their collaboration on using their technology on home theater and business projectors and demonstrated a prototype PhlatLight LED based DLP home theater front projector. They also announced products will be available in the marketplace later in 2008 from Optoma and other companies to be named later in the year. Luminus Devices PhlatLight LEDs have also been used by Christie Digital in their DLP-based MicroTiles display system. It is a modular system built from small (20 inch diagonal) rear projection cubes, which can be stacked and tiled together to form large display canvasses with very small seams. The scale and shape of the display can be any size, only constrained by practical limits. The first commercially-available laser-based DLP HDTV was the Mitsubishi L65-A90 LaserVue in 2008, which also eliminated the use of a color wheel. Three separate color lasers illuminate the digital micromirror device (DMD) in these projection TVs, producing a richer, more vibrant color palette than other methods. See the laser video display article for more information. On February 2, 2000, Philippe Binant, technical manager of Digital Cinema Project at Gaumont in France, realized the first digital cinema projection in Europe with the DLP CINEMA technology developed by Texas Instruments. DLP is the current market-share leader in professional digital movie projection, largely because of its high contrast ratio and available resolution as compared to other digital front-projection technologies. As of December 2008, there are over 6,000 DLP-based Digital Cinema Systems installed worldwide. Texas Instruments remains the primary manufacturer of DLP technology, which is used by many licensees who market products based on TI's chipsets. The Fraunhofer Institute of Dresden, Germany, also manufactures Digital Light Processors, termed Spatial Light Modulators, for use in specialized applications. 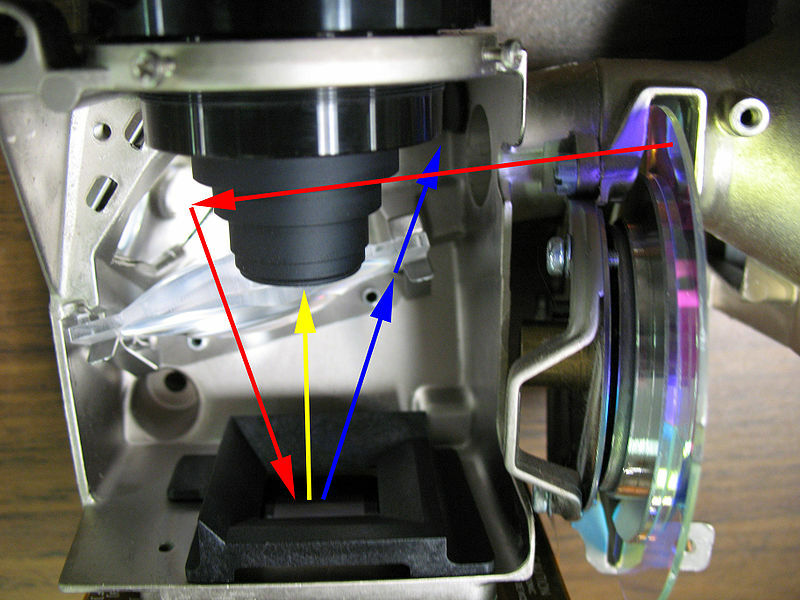 For example, Micronic Laser Systems of Sweden utilizes Fraunhofer's SLMs to generate deep-ultraviolet imaging in its Sigma line of silicon mask lithography writers. DLP technology has quickly gained market share in the front projection market and now holds roughly 50% of the worldwide share in front projection. Over 30 manufacturers use the DLP chipset to power their projectors. DLP rear projection TVs generally have a smaller form factor than comparable CRT projectors. DLP rear projection TVs are considerably cheaper than LCD or plasma flat-panel displays and can still offer 1080p resolution. New LED and laser DLP TVs and projectors eliminate the need for lamp replacement. Using two projectors, one can project full color stereoscopic images using polarized light (because beams can be polarized). 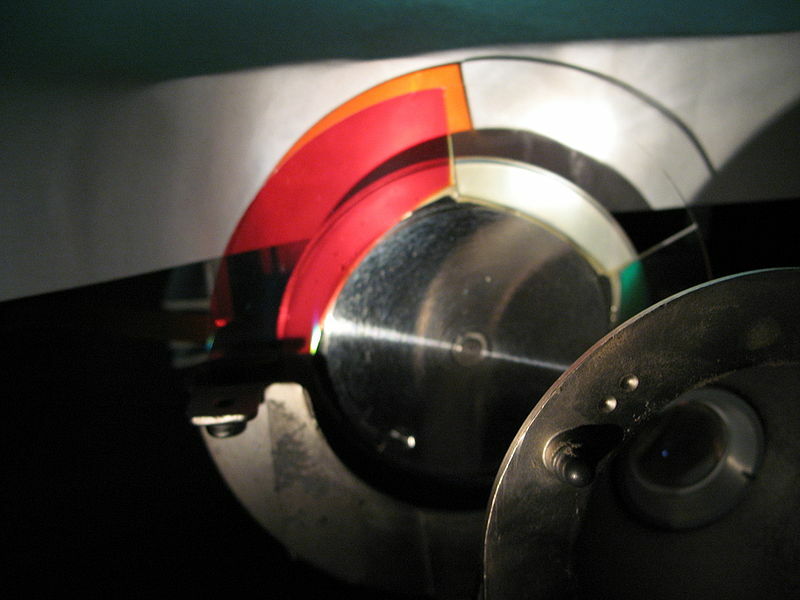 DLP projectors do not suffer from "color decay", often seen with LCD projectors in which the image on the screen yellows after extended periods of usage. Some viewers are bothered by the "rainbow effect" (explained above). Replacement of the lamp / light bulb. The average life span of a TV light source averages 2000–5000 hours and the replacement cost for these range from $99 – 350, depending on the brand and model. After replacing the bulb a few times, the cost can easily exceed the original purchase price of the television or projector itself. Newer generations' units use LEDs or lasers which effectively eliminate this issue, although replacement LED chips could potentially be required over the extended lifespan of the television set. Some viewers find the high pitch whine of the color wheel to be an annoyance. though the drive system can be engineered to be silent and some projectors don't produce any audible color wheel noise. Response time in video games may be affected by upscaling lag. While all HDTVs have some lag when upscaling lower resolution input to their native resolution, DLPs are commonly reported to have longer delays. Newer consoles such as the Wii do not have this problem as long as they are connected with HD-capable cables. Some people may be able to observe a phenomenon in which the projected contents appear to be cycling through its colours for the duration of the presentation. This is most easily seen by using a camera's 'live view' mode on projected content.